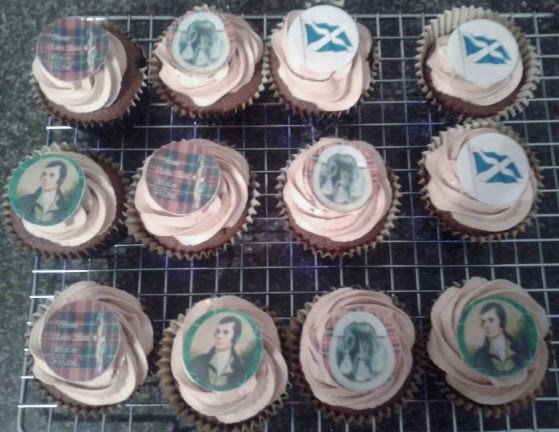 Well readers, I’ve been getting bake-a-licious again. Last weekend was a fundraiser for a local children’s cancer charity, which I closely support. So I offered up six boxes of my finest (!) cupcakes for the tombola. As a side point, I’d like to add that the event was in aid of TCCL and that over £2,000 was raised on the night, so I guess the cakes must have been ok!!! 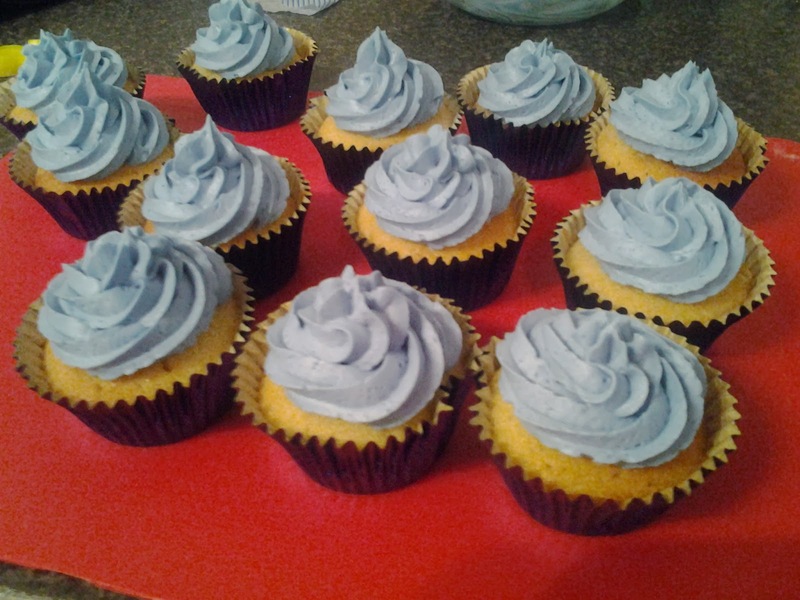 I’m normally a vanilla kind of girl (no sniggering at the back please…) and I’ve found a foolproof recipe for vanilla cupcakes, which I’ve posted here. It’s never let me down so far, so I’ve stuck with it. However, seeing as I planned to gift these cakes, I figured I better make an attempt to impress the crowd and roll out a chocolate cupcake recipe. Thank you so much to the lovely person at All Recipes UK, who posted this fab recipe, which you will find here. I made some minor adjustments, relating to temperature and cooking time, according to my oven, which I’ve noted below, but pretty much worked with the original recipe, which was fantastic. I ended up making a batch of vanilla and a batch of chocolate (just in case one went wrong) but ended up with 30 edible cakes, which I boxed up and gifted. I used my usual buttercream recipe (it’s here) but also adapted it to create a chocolate version which I’ve posted below. 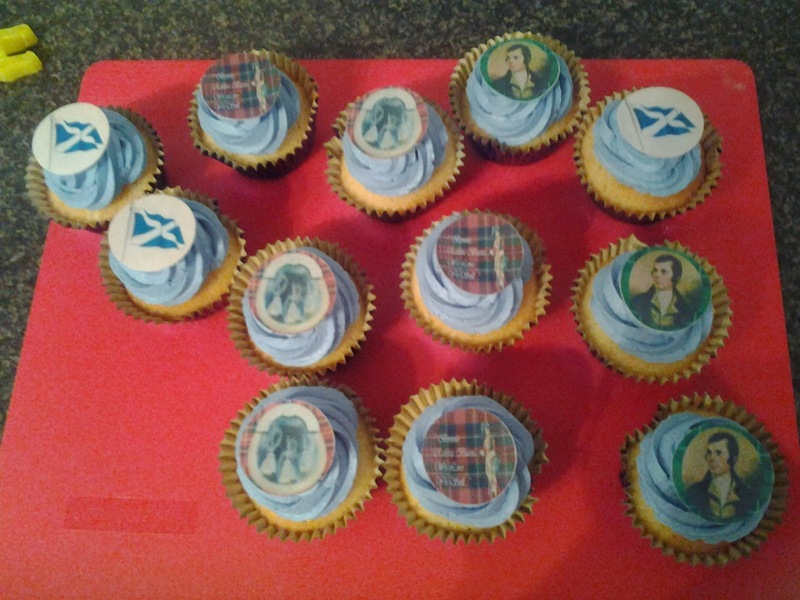 Oh and to finish, used some printed rice paper Scottish motifs which I got online. I may not be “Chieftan of the puddin’ race” – Scottish joke – look it up – but I may have ended up the “Chieftan of the Chocolate Cake” this time round. New title perhaps?! Don't underestimate the power of a hand mixer when making buttercream. Softened butter + mixer = easy to cream! Be cautious when adding icing sugar to start - you may end up with snowstorm. Use the chocolate recipe as a basis for a chocolate birthday cake - just scale up according to your tin size, keeping everything in proportion. Sift the cocoa into a large bowl; add 7 dessert spoons of boiling water and mix into a thick chocolate syrup, adding more water if you need to. Add the softened butter, sugar, self-raising flour, baking powder and eggs. Mix with electric beaters until smooth and evenly mixed. 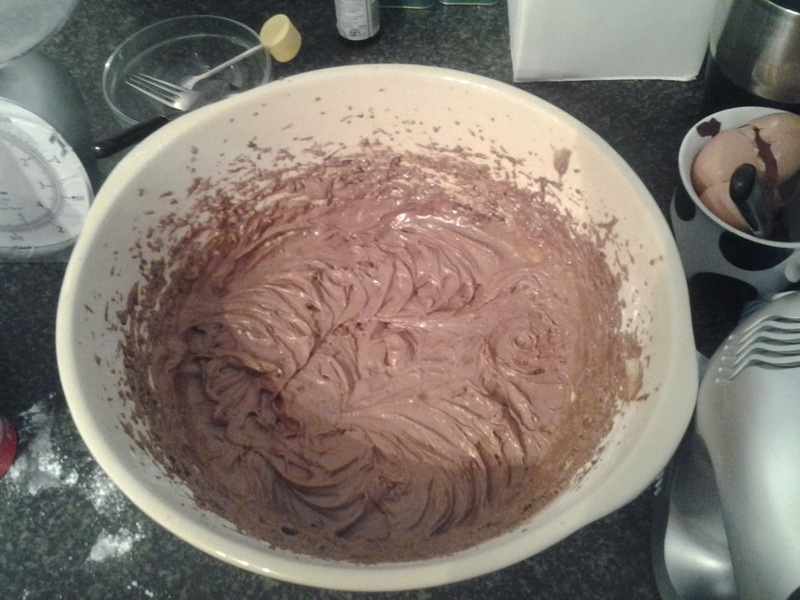 Seriously fluffy mixture! Possibly my best batter ever! Melt 100g of good quality chocolate in a glass bowl, over a pan of barely simmering water, ensuring the water does not touch the bowl. Stir until melted, then remove from heat and do not use until it’s no longer hot to the touch. Beat the butter until smooth, using an electric mixer and slowly add in the icing sugar, creaming into the mix as you go, using the mixer. I tend to taste as I go, to make sure it’s not too buttery. You can add more icing sugar, to your taste, but make sure it’s still smooth enough to be piped (not too thick). Pour in the cooled, melted chocolate and using your mixer, combine all ingredients together, until you have a smooth chocolate buttercream. If the mixture is too thick, add a splash of milk, to loosen it. Make sure cakes are cool, then pipe swirls over each cake, in a circular motion.